Eventually (when I get more sleep and a pay raise), I’m going to do some real scientific research on holiday foods and why we get stuck on such particular details about how soggy we like our stuffing (for one), but for now, I’ll just keep pushing recipes down your throat that I love, whether or not they may be the most classic holiday recipes around. 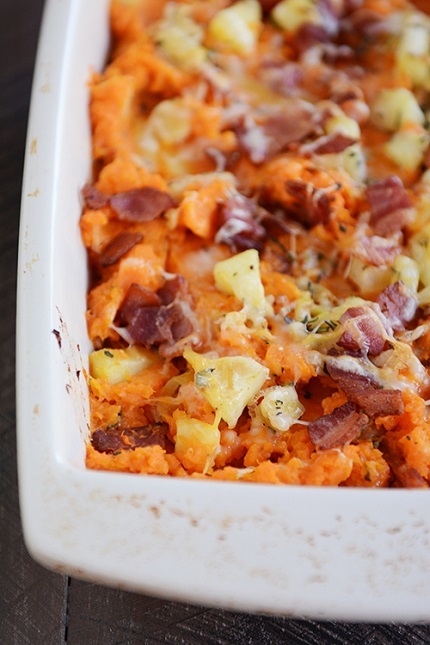 This sweet potato casserole is perfect evidence of how I like my sweet potatoes – loaded with bacon and cheese and other savory influences. I know I’m like the lone woman on the planet who just can’t do the whole super sweet, basically dessert, marshmallow-topped sweet potato thing at Thanksgiving. I’ve tried to like it. I really have. I’ve tried different recipes (many of you have sent me versions over the years after I lament my distaste) but I’ve never been fully converted. That’s ok, though. So many of you love them that I think the marshmallow industry is perfectly safe. I’m here to represent those that might want to change up the ol’ sweet potato casserole. A couple months ago when I was inhaling stuffed sweet potatoes for dinner, I had the thought that all of the flavors were screaming to be made into a sweet potato casserole for Thanksgiving this year. And so I went for it. Living life on the edge and all that. And wow, this dish is so incredibly yummy (and easy). Tender sweet potatoes are mixed with thick bacon pieces, sweet-tart apples and savory leeks (+ a few subtle but necessary spices). Oh, and cheese! 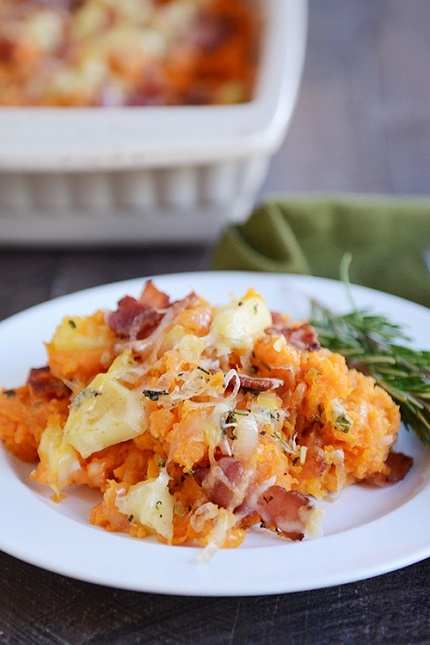 There’s cheese (go for the Fontina, it’s amazing) and the whole combination is the sweet potato casserole of my dreams. If you just can’t take the plunge for Thanksgiving. Don’t worry. Me and my sweet potato casserole aren’t going anywhere. We’ll be here any other night of the week for ever and ever because just like any fabulous recipe, this shouldn’t be made only once a year. Preheat the oven to 400 degrees F. Wash and dry the sweet potatoes. Prick each potato four or five times and place on a foil-lined baking sheet (to catch any syrupy drips in the oven). Bake for an hour or so until tender. Let the potatoes cool until they can be handled easily without burning your little fingers. In a skillet, cook the bacon until crisp. Remove the bacon pieces to a paper-towel lined plate, leaving a teaspoon or so of drippings in the skillet and removing any excess grease. Over medium heat, add the leeks, apples, brown sugar, sage and rosemary to the skillet. Lightly season with salt and pepper. Cook, stirring often, until the leeks and apples have softened and caramelized slightly, 7-10 minutes. Cut the sweet potatoes in half and scoop out the flesh into a large bowl (you'll want about 6 cups or so). Add the 1 teaspoon salt and 1/2 teaspoon pepper and mash the sweet potato filling with a fork or potato masher until it's as smooth as you like it. Add about 3/4 of the cheese, bacon and leek/apple mixture, reserving a bit of everything to sprinkle on top. Stir lightly to combine. Add additional salt and pepper to taste, if needed. Lightly grease a 3-quart (or so) baking dish and spread the sweet potato mixture evenly in the pan. Sprinkle the rest of the bacon, leek mixture and cheese over the top. Bake for 15-20 minutes until hot. Serve immediately.